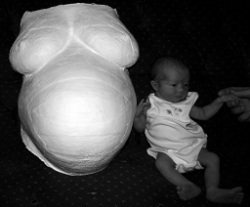 Belly casting is a plaster mold of a pregnant woman's belly. Some women just do their bellies while others may do their breasts and even their hands on their bellies during the molding process. After it is complete, the finished casting can be painted. You can store it away, hang it up somewhere or even use it as a decorative bowl. The choice is yours. If you do a belly casting search, you can find some really neat examples and ideas. 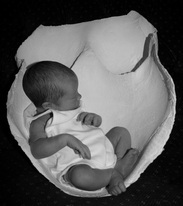 Belly casting is free to all paying doula clients. If you are not a client but would like to have a casting done, please contact me for pricing.